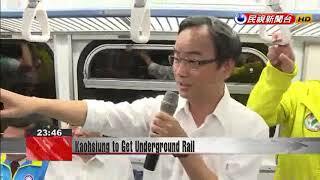 Kaohsiung's underground railway project is in its final stages and will start service on Sunday. Ten years in the making, this NT$100 billion-dollar project adds seven below-ground stations to Kaohsiung's rail network. The Taiwan Railways Administration says that train timetables will be adjusted for the new stations, so passengers should check for changes in the coming days. New structures flanked by beautiful belts of green space. Kaohsiung's new underground railway has refreshed the landscape of downtown Zuoying. Those screens are the same as the ones on the MRT. They'll tell you this is Kaohsiung Station and that the next stop is Minzu Station. This is the newest type of train car, called the EMU800. The underground rail line took a decade to build, and it adds seven stops between Zuoying and Fengshan. All-new express cars will stop at Neiwei, Fine Arts Museum, Gushan, Sankuaicuo, Minzu, National Science and Technology Museum, and Zhengyi, covering a distance of 15.37 kilometers. A crucial matter to sort out is the shuttle pick-ups and parking situation above-ground. We will continue to work on it in the future. The TRA reminds passengers to check their train schedule for changes before heading out to the station. We are strengthening the so-called express link, which includes the Tze-chiang and the Chu Kuang trains. We are also adding local express trains, taking the fleet from the original 80 to 100. On opening day this Sunday, the TRA will issue commemorative train tickets to passengers of the underground rail. All TRA souvenirs will be offered at a discount as the railways administration marks a new chapter in Kaohsiung.